Extruder shown in this page is of simple, strong design, which, besides easy, troublefree operation, also provides for turning out a wide range of different puffed products. It can process lots of different raw materials, either singly or mixed, including maize grits, broken rice, wheat semolina, whole wheat, bran etc. The core of the machine is the head which comprises cylinder, extrusion screw and die. It is fitted with two interchangeable heads, one long and one short. Which one is used depends on product and what type of raw material is being processed. In order to grant a high degree of versatility, the extruder screw can be driven by a suitable A.C. motor or on request by a D.C. motor at variable speed. Besides individual extruders, we supply whole processing lines from raw material infeed to finished product. Capacity 120 or 220 or 420 Kg/h of finished product. 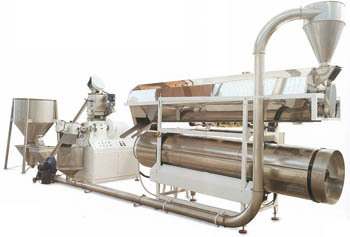 The illustration shows a line for making flavoured corn curl consisting of: a raw material bin/mixer with an extruder supply screw, the extruder, a pneumatic conveyor, a gas-heated rotary drier and a rotary flavouring drum complete with a flavouring supply tank.